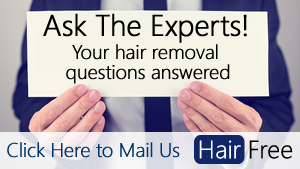 Laser hair removal is an increasingly popular method of hair removal - however it's not right in every situation. There is a lot of pro laser hair removal content on the web and perhaps the flip side of the coin is under-represented. So we've created this article to provide some balance for you to make an informed decision about going ahead with laser hair removal. The financial side of laser hair removal is often overlooked. Successful laser hair removal treatment requires a number of sessions, often over a period of many months. Given that each session is likely to cost $200-$400 (depending on the area being treated), the total cost can easily add up to thousands of dollars. You have to be willing to "lose" the few thousand dollars that it will cost to go ahead with the full treatment process. Even if you don't get any results from the treatment (something that is entirely possible), you have to be in a position to be able to write off the expense without putting yourself in a tight spot financially. Whilst a number of clinics do offer credit, this simply means that you will be paying a log a lot more in the long run. Instead, it makes much more sense to use some temporary forms of hair removal and save up the money that you need to have the full treatment slightly further down the road. We've written about this many times before on this site, but it's really important that you do your homework to find a good laser hair removal clinic. In many states in the US, and other countries around the globe, laser hair removal is unregulated. This means that anyone can legally claim to be proficient at laser hair removal. Unfortunately, some clinics use pressure sales tactics on prospective clients to try to make the sale. Sometimes consumers are offered a time limited discount and told to make the decision on the spot without being given enough time to fully consider their options. Tattoos are a big no no when it comes to laser hair removal. The dark pigment of the tattoo will absorb the power of the laser more than natural skin would and thus may lead to nasty burns on the surface of the skin. In some instances, this can lead to permanent scarring. It goes without saying, but there are a lot of lasers on the market that are not FDA approved and thus not guaranteed safe for use. ​Ask your practitioner what type of laser will be used and make sure that it is listed in the FDA approval database by following the instructions here. ​If you're more than four on the Fitzpatrick scale then you have a dark skin colour that isn't suitable for use with some lasers. Only certain lasers can be safely used on people with darker skin tones. These include the Alexandrite (to a certain extent) and the Nd:YAG. If you have darker skin, make sure you ask questions about the type of laser used and its suitability for your skin. Most clinics will happily provide you with a patch test so that you can make a full and informed decision. If, for whatever reason, the clinic is not allowing you to take a patch test, then don't go ahead with the treatment with that particular clinic. While the efficacy of laser hair removal has been fairly extensively proven through clinical studies, certain people don't respond to the treatment. In fact, even "ideal" candidates who have coarse dark hair and very light skin sometimes don't respond to laser hair removal treatment. Despite research, we still don't know why that is. ​You can never be sure beforehand whether you fall into this category or not. In other words, it's a calculated gamble. How Soon Can Results Be Seen with Laser Hair Removal?